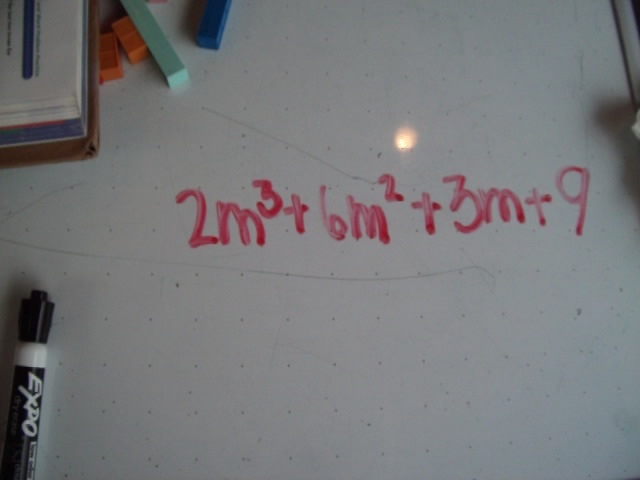 Here is a fast lesson where I show a 15 year old what her text book is trying to teach her when they talk about factoring by grouping. You can see the distributive theory if you have mastered the concept, but if you haven't trying to take these third power polynomials apart and factor them can be intimidating. But once yo know how, it's easy and once you can actually SEE what you are doing it's easier still. Here you see no pictures, which can make it very difficult to do the math, most students (and by most I mean 99%) like it when they can actually see what they are doing rather than just using rules and process to factor these problems. Most teachers and professors I show this to are absolutely STUNNED. For problems like these you need a password. They are covered on password protected pages at CRHOM click on Advanced Algebra. (You need a password). There's plenty of 3rd power algebra on this blog and on my website for free though. The term advanced algebra is amusing when you see how easy it is. Once you understand the concepts, bigger is just funner. Here is a quick video I made covering basic factoring by grouping...staying positive, I put three short videos together and the last one shows what the picture looks like. We spent lots of time going over the pictures and suddenly the rules made sense. This is the second example and by the time we got here it wasn't very hard. If you look around on this blog you'll see an 11 year old doing this and more. And of course little kids can get in on the act too, since all math is is counting once you know what to count and how to count it...here are 4 and 5 year olds playing with "advanced" algebra. For them they are basically learning how to build rectangles and add and do some simple multiplication. 3rd power algebra is a "by-product" of the lesson not the focus of the lesson. Algebra For Addends and Multiplication.